First off, props to Adronetto for being so young and getting a book published. She's 18! When I was 18 I couldn't figure out what pairs of jeans to wear to the movies. Good for her... I think this book has good bones, but there were SO many things that went wrong that it basically ruined the story for me. Overall....too long! Why, oh why, do we need to hear half of this stuff going on with external and expendable characters. We read about the most nonsensical things that totally distract the reader. This happens too often for me. Around page 300 is where the conflict starts to happen. Yes, page 300. Bethany's BFF, Molly, and her constant pining for Gabriel (yes, that angel) was over the top. When we weren't reading about Bethany's love for Xavier we were reading about Molly's scheme to win over Gabriel. Ugh! It was hinted that Molly thought she knew Gabriel before they met. Are we being set up for book 2? Every time Molly comes up with another scenario to get Gabriel's attention, Bethany puts in little attempt to sway her friend. Hello (knocks on door) is anyone buying this? I was always asking....what in the world do Molly and Bethany have in common? Why would they ever be friends? Just another premise I didn't buy. 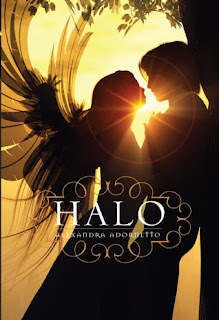 I like that Adornetto explains the hierarchy of angels and their divine purpose. I would have read more about this. What was Bethany's divine purpose? She couldn't focus on anything but Xavier for 5 minutes for us to find out. Cover art - amazing! I think a lot of teens will read this book, and for that, yay! It's a large book and if a teen can get through it, I hope they move on to better reads.